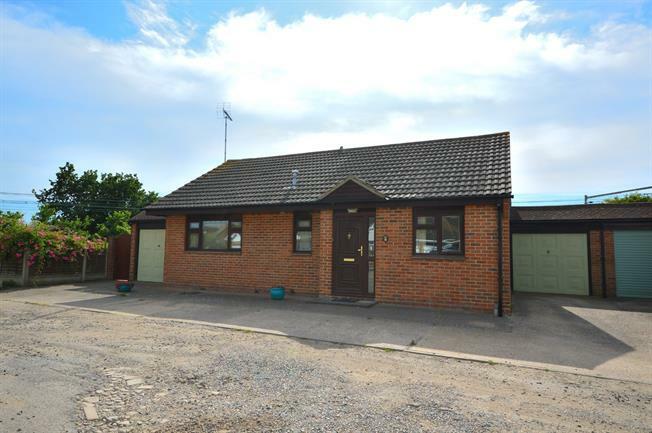 3 Bedroom Detached Bungalow For Sale in Rochford for Asking Price £300,000. Abbotts are delighted to welcome to the market with no onward chain this fantastic detached bungalow situated in a quiet road with fields to the rear and boasting two garages. The versatile accommodation features two/three bedrooms including two fitted bedrooms, plus a third bedroom/dining room. The is also a well sized living room with patio door opening to the rear garden, a fitted kitchen leading to a lean-to, plus a fitted bathroom. Externally this delightful property enjoys pretty rear and side gardens, two attached garages and a driveway. Approximately 815 square feet (plus garages). UPVC double glazed door front, loft access, coved ceiling, airing cupboard, electric storage heater. Double glazed Patio doors to the rear opening onto the garden, coved ceiling, fireplace with electric fire, electric storage heater, additional wall lights. Fitted wall and base and units drawers, roll edge work surfaces, single sink and drainer with mixer tap, tiled splashbacks, electric oven, electric hob, overhead extractor, spaces for a fridge/freezer and washing machine, double glazed window and back door opening to the lean-to. Sliding doors to both sides opening onto the garden, window facing the rear. UPVC Double glazed window facing the rear overlooking the garden, fitted wardrobes, coved ceiling, electric storage heater. UPVC Double glazed window facing the front, fitted wardrobes, coved ceiling, electric storage heater, double doors to a concealed en-suite style shower. UPVC Double glazed window facing the front, coved ceiling, dado rail, additional wall lights, electric storage heater. Low level WC, panelled bath, shower over bath, pedestal sink, tiled walls, obscure uPVC double glazed window facing the front, electric heater. Lawn and patio areas complemented with plants and shrubs to borders, outside tap, personal access to garage one. Side garden with a further lawn and shrubs to borders, timber shed, personal access to garage two, gated side access. Up and over style garage door opening onto the driveway, side door opening onto the garden, window facing the rear, power and lighting connected. Up and over style garage door, rear door opening onto the garden, window facing the rear.